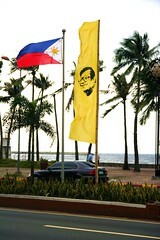 Last Thursday, August 21st, marked the 25th year since the death of Ninoy Aquino. His opposition to the Marcos dictatorship and subsequent assassination sparked the flame of outrage which would lead to the EDSA People Power Revolution of 1986, sweeping Marcos from the presidency and restoring democracy to the Philippines. Ninoy’s wife Cory became President, and the Marcoses were exiled to Hawaii. This homily given in Ateneo during a memorial mass by Philippine Jesuit provincial Fr. Jojo Magadia delves into the religious implications of Ninoy’s life and death from a Filipino Catholic perspective. Speaking as a Baptist, I’m not too keen on his typological approach of likening Ninoy’s death on an airport tarmac to the death of Christ on the cross — though the implication is that the sacrifice of Ninoy served as inspiration and catalyst, as opposed to the transcending sacrifice of the Crucifixion which was propitiatory — but of greater interest to me was Fr. Magadia’s account of Ninoy’s conversion experience while in the midst of imprisonment and torture, exemplifying the concept of koinonia. Twenty-five years. Since then, as we all know, the Marcoses have returned to the Philippines and re-ascended with their cronies to various positions of power (except old Ferdinand, whose refrigerated body is on display in a mausoleum), while corruption and stupidity thrive at all levels of government, and the Philippines continues to suffer through the slings and arrows of lessons still not learned, even a quarter-century later. Pretty much what I said six years ago. Yet in the midst of the unrest and chaos, a salute to those who still work for justice. Di ka nag-iisa.